H. E Governor Mutahi Kahiga, met the CS Agriculture Hon. 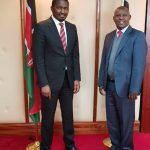 Mwangi Kiunjuri at his Kilimo House Office,Nairobi on 25th July 2018 where they discussed partnership between National Government and County Government of Nyeri in matters of agriculture. The governor expressed his excitement over the allocation of Ksh. 120 Million to Kaigonji Water Project that will go a long way to benefit Tetu and Mathira Sub Counties.